Hello beautiful people! Another week and closer to May! The month May is looking like the best month--birthday + graduation...I am excited :) Hope everyone had a great weekend. I spent my day as usual in the library. In fact, if you follow me on Facebook, I posted a comment complaining how tired I was because I was in the library on Sunday until 1am working on 40 page paper. Thank goodness that is over now because I just submitted it about an hour ago. Now, all I need is sleep. The word "sleep" is missing in my syllabus. Living the color combo!!!! U look so chic yet classy!!!! love all the accesories!!! great look!!! what size do you wear in Zara pants? You look adorable,the colours are so perfect together!And your Lipstick-I love it,awesome colour! Gorgeous look!Love the color combo! totally love the two colors together.. The shirt is breathtaking:) I love the leopard insertion:)! Love love love this colours, and his combo!! Is perfect and looks beautiful on you!! love pants and shoes ! such a gorgeous outfit!! loving the contrast of the colors and that blouse is just too fierce with the leopard print trimming! I love those pants I just got a silimar pair from forever 21. LOVE this look my dear, the blouse, the colours, the shoes! Great! This is fresh color combo I haven't seen before, well done. 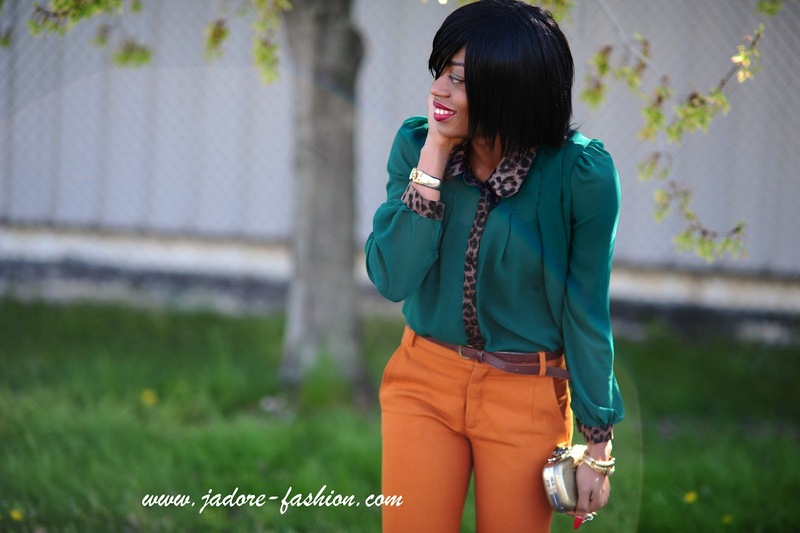 Love this blouse and the orange trousers! Congrats on submitting your paper! Yay school is almost done =) I'm so happy for you =) Gorgeous outfit so chic and colorful. Wonderful combination darling, u look splendid!! Marvelous blouse, I fell in love with it!! Nice mixing of colors! LOVE that blouse and the leopard print trim! Loving the color of your nails too RAWR!! Now this is what fashion is all about! Love this look and how you put it together. The color combination is awesome! Super cute outfit. Thank you all so much for all the sweet comments. I love those pants! They are such a good colour, vibrant but subtle and the way in which you paired it with that deep green, goes perfectly. Thank you for your wonderful comment! Amazing mix of colors! Brava! WOW! LOve that outfit! You look amazing! Loving the colours, Oh how cool that our birthdays are the same month! I can't wait to celebrate mine even though I'm not quite sure what I will do. You are so freaking gorgeous!! How is this possible??! :) I want you to come over and style me head to toe! Great outfit! I especially love the pants and shoes. I absolutely love the color combo. Lovely! oh what an amazing colour combo darling! i love that shirt madly! I have pants that color! Love em! cute look!